Bring a touch of style to your living room without taking up too much space with this compact two seater. New arrivals include this classically styled small sofa that’s part of the Eleanor sofa range also consisting of medium and large sofas, storage footstools, armchairs and sofa beds. Designed with a country house feel makes this range perfect for traditional interiors. Be inspired by the traditional and contemporary designs available at M&S and give your home a quick makeover. Whether it’s a complete three piece suite, chaise longue or just an occasional chair you’re after creating a new look is easy. 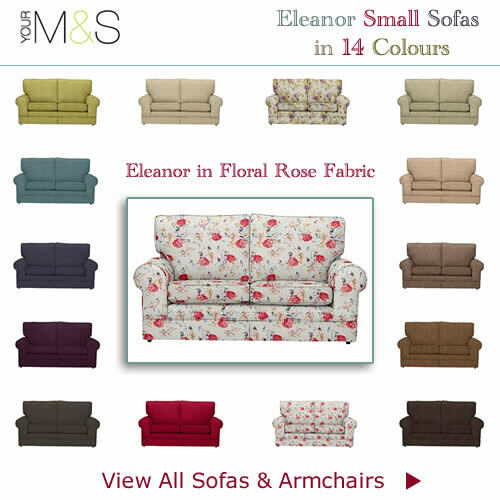 The Eleanor small settee comes in 14 fabulous colours in a great mix of designs and materials. Matching existing decor and upholstery will be a breeze with delightful summery hues and new season shades. When space is premium you don’t want too much clutter in a room so what better way to keep things neat and tidy than a matching storage stool. This clever piece of furniture not only has plenty of storage inside it acts as an extra seat and comfy footstool. Another great space saving idea is a sofa bed. The Eleanor medium sofa bed is ideal for studio apartments, spare rooms or wherever you require a quick put up bed for unexpected guests.